After numerous hours of planning and preparation, the Surfing for Autism 2015 event occurred on August 14th and 15th at Jeanette's Pier in Nags Head, North Carolina. It was the sixth annual event, made possible by the efforts of many amazing volunteers, local surfers, and the contributions from community businesses. I had been asked to arrive mid-afternoon on Friday, the 14th to welcome and greet folks as they arrived at Jeanette's Pier. The first scheduled occurrence was the Meet and Greet, which started around 5:30. At this time, families had dinner provided and had the opportunity to meet others who are there to participate in the event. During the Meet and Greet, there is usually the official welcome, announcements, recognitions, and a raffle. Little did I know, I was about to be completely surprised by what was going to happen at this presentation. I had heard that photographer Bob Sumners was to be recognized. His wife, Ann, who is one of the Surfing for Autism Board members, was giving the speech for the recognition. It had been kept a secret up until this moment. I sat down toward the front to be able to video what was about to happen. As I did, I thought to myself, "Isn't it awesome that Ann gets to make the presentation to her husband, Bob." As Ann began reading her prepared speech, I was grinning from ear to ear in anticipation of Bob's being recognized. However, the further along she got into her speech, what she was saying didn't sound like it applied to Bob. As she came to the end of the speech, I was shocked to realize that she was speaking about me. (L. to R.) Mark Slagle, Jennifer Lunceford, Eileen Lowery, Ann Sumners, George, Jean Graham, Becci Shealey, and Lisa Ammons. I was honored to be the recipient of the Eric Gardner Memorial Award. Although it totally blew me away, I was very blessed to receive this recognition. 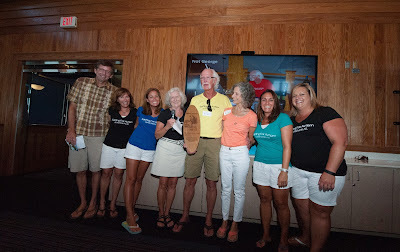 I appreciated the members of the Surfing for Autism Board selecting me to be the recipient of this great honor. The plaque I received was in the shape of a surfboard. At the top of the board was my name, with the Surfing for Autism logo and Surfing for Autism Outer Banks, NC 2015 in the middle. Just below, it reads, "Eric Gardner Memorial Award. In appreciation for your dedication, generous support and giving spirit. May you realize the countless smiles, encouragement, and hope, you bring to all those involved with Surfing for Autism." Eric Gardner was an Outer Banks local whose coffee shop, Southern Bean, kept people awake and focused for years. He was a dedicated father, husband, and surfer who supported Surfing for Autism (SFA) with all he had. Eric passed away unexpectedly in 2013 and SFA honors him by an annual award given to someone who exemplifies Eric’s love for SFA, dedication to community, and passion for helping the children we serve. After the Meet and Greet had concluded, the siblings of the participants in Surfing for Autism were provided the opportunity to go fishing. The participants and their families watched a special social story to help them to prepare for what would be happening. Then, the participants had a chance to get surfing lessons from the surfers down on the beach. Watch the Social Story video below! The next day, Saturday, August 15th, the main event took place. Over the years, the annual event has grown, not only with the number of participants but more importantly, with all the folks who come out to be part of the event. This year there were over 80 participants and the largest crowd of supporters that have ever attended. 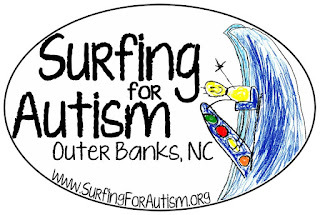 Surfing for Autism was started in 2010 by Eileen Lowry and Mark Slagle, who are parents of children with autism. At the time, Eileen was the president of the local chapter of the Autism Society of NC. She met Mark, a local surfer, and they developed a plan with the help of several other educators and surfers which resulted in the first annual Surfing for Autism event. That year there were over 30 participants who were able to surf at no cost to their families. Watch highlights from the Surfing for Autism 2015 below! The mission of Surfing for Autism is to offer individuals and families impacted by Autism Spectrum Disorder (ASD) a supportive environment to connect and share by creating opportunities to experience the therapeutic benefits of surfing. Through these opportunities, Surfing for Autism is also creating a greater awareness and a deeper understanding of ASD within the community.